Theatre 3 has seen some fine productions over the years, but few of the calibre of of Rep’s current production of Neil Simon‘s Lost in Yonkers, the preview for which I saw tonight. Lost in Yonkers is apparently a well-known play, which simply reveals my ignorance, because I’d never heard of it until I heard about Rep’s production. It’s the story of two brothers left with their cantankerous grandmother when their recently-widowered father has to go on the road to repay the debts incurred in the course of losing his wife to cancer. The Second World War being underway, and the Great Depression just barely relegated to memory, opportunities are few, but the loyalty of this barely functional family forms a great basis for Simon’s exploration of human relationships. And the cast delivers Simon’s characters with aplomb. 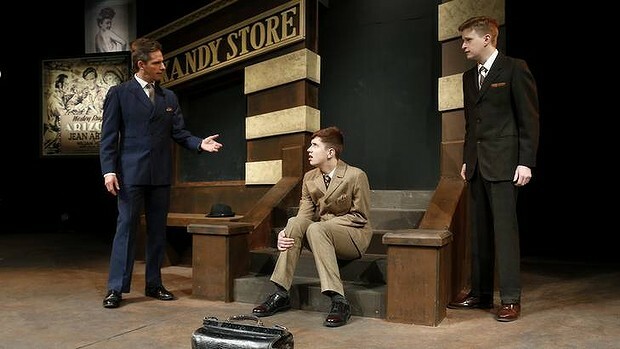 Lachlan Ruffy has received more than a few compliments for his theatrical activities, and this production demonstrates how well-deserved they are. His performance of Jay strikes a careful balance between the impetuousness of childhood and the control of a maturing adolescent. He is complemented wonderfully by Pippin Carroll, who plays the younger brother Arty with a comparable balance of naivety and wisdom beyond his years. Bridgette Black’s Bella brought a lot of energy to the stage throughout the show, and with just the right amount of pathos to be able to carry off her more intense monologues as the plot reached its crescendo, without losing anything from the character’s comic qualities. It is the illusion of ease with which the play is delivered that really stamps this as a production of the highest calibre. There is no point at which the actors appear to be labouring, which of course indicates that they’re working harder than most do. This production has that wonderful quality that marks all the best productions; a simple, forthright telling of a story, with nothing to draw our attention to the artifice of the theatrical process. It puts the audience at ease and creates exactly the right environment for the suspension of disbelief. One of the noteworthy elements that goes into producing this effect with this production is the use of the New York accent. One of the most difficult American accents for Australians to emulate, this cast have pulled it off admirably. Even Paul Jackson, who may be thought to have had a head start on the accent, must have worked hard to get his gangster right. Despite a few slips of pronunciation from one or two members of the cast, the greatest achievement here is the uniformity of the accent across the cast, which is, when using foreign accents on stage, more important that accurate emulation from any individual actor. And when it comes to the use of foreign accents on the Canberra stage, I’ve rarely been convinced; this may be only the second or third Canberra cast who have caused me to forget that they’re a bunch of Australians bunging on an accent. Lost in Yonkers is a solid production; one of the very best I’ve seen on the Canberra stage in my (almost) fifteen years in this town. Brilliant performances, superb direction, a great set, clever lighting and Neil Simon’s excellent script make for a laudable production. The rule here is, see this show, or forfeit the right to speak with any authority on the quality of theatre production in Canberra. That is all.